Well, Spring has arrived, and I found out. Walking past their hous e the other day, I noted the garage door was opened. What did I see inside? Several garbage cans and tons of junk. Yup! They keep their car in the driveway because the garage is too full of clutter to park inside! If you have a similar challenge with your garage, take advantage of one of these nice Spring days and get the garage organized. If you don’t currently have shelving in the garage, consider either purchasing some heavy duty utility shelves that can line one wall in the garage, or have a carpenter build some sturdy shelves for you. Purchase some large plastic containers with lids and group like-items together. For example, you can have a container for car accessories with things like windshield washer fluid, jumper cables and snow scrapers. Another bin can house barbeque supplies such as long-handled grill utensils, mitts, grate scraper while a third could house electrical supplies (i.e. extension cords, three-way adapters, etc.) Label the outside of each container clearly so that all family members will know what is stored inside and, equally important, where to return things after use. 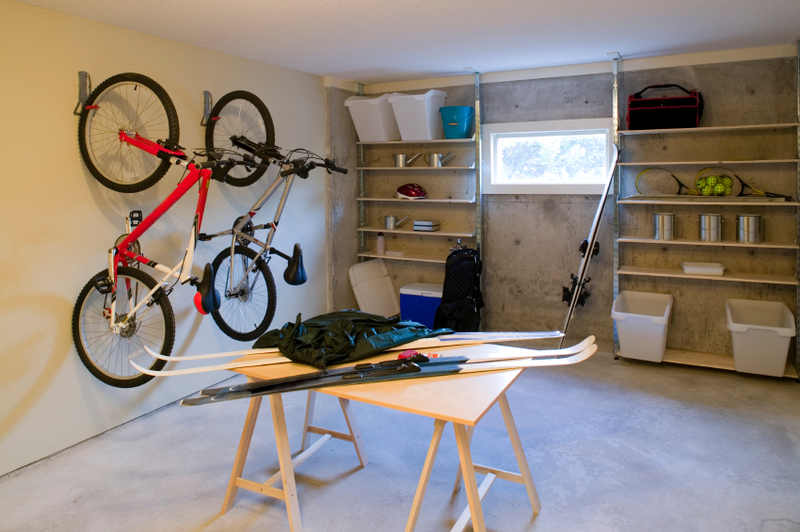 The walls and ceiling s in most garages have tremendous storage capabilities. Hanging not only expands your storage, but things become easier to find because they are not clustered together on the floor. Designate a section of wall space to hang big things like shovels, rakes and ladders. You can also purchase specially-designed hooks so that bicycles and strollers can be supported on the wall. If your garage has open rafters, you can line large items (ie., skis, pieces of wood, etc.) across the ceiling beams. Sports equipment can be accommodated in several ways: Sports equipment racks can be purchased at hardware or organizing stores. Clean empty garbage cans can store long-handled items like lacrosse sticks and baseball bats. You can also purchase an inexpensive 5-shelf metal utility unit and assemble it with the shelves installed upside down. What this does is create a lip to keep things like balls, roller blades and so on from rolling of the shelf. You can use a few nuts and bolts to attach a length of pegboard on each side of the utility shelf. This will provide you with a place to hang odd-sized and oversized sports equipment such as racquets, cleats, swim fins and fishing poles. 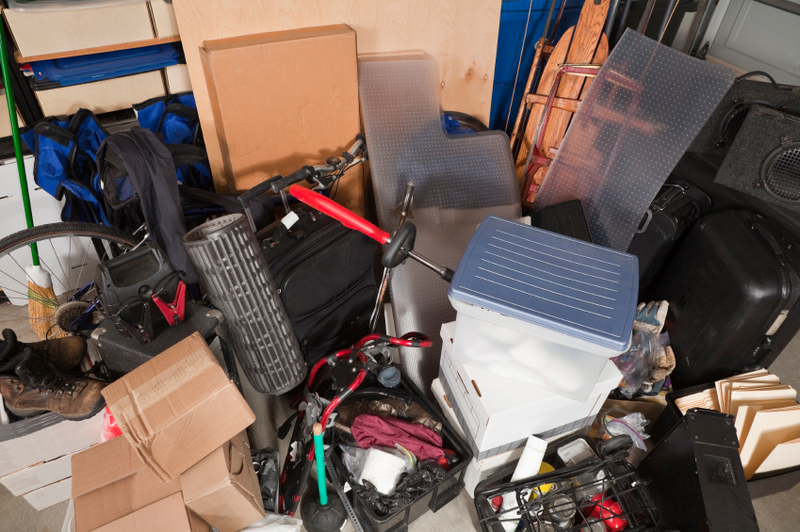 The other thing to keep in mind is that garages, like attics and basements, can become permanent resting grounds for unwanted things that find their way into your home. Carefully evaluate whether all the items that are currently in your garage are things that you really use and want. If not, pack up those things you no longer need in your life and either donate them, Freecycle them, or pass them along to someone who would appreciate them. Roll up your sleeves, start organizing and discarding and you’ll be parking in your garage in no time!